Designed by dermatologists, the Complex 15 line of products is truly unique. It acts directly on skin dehydration. Several environmental factors cause the skin to lose part of its moisturizers, molecules that retain water. The Complex 15 products promote skin rehydration by replacing the lost moisture. Ingredients: Water/Eau, Caprylic/Capric Triglycride, Glycerin, Glyceryl Stearate, Dimethicone, PEG-40 Stearate, Squalane, Cetyl Alcohol, Glycol Stearate, Myristyl Myristate, Stearic Acid, Lecithin, C10-30 Cholesterol/Lanosterol Estrol, Diazolidinyl Urea, Carbomer, Magnesium Aluminum Silicate, Sodium Hydroxide, BHT, Tetrasodium EDTA. Have used for over 20 years and love this lotion. Went to Canada to get. Absorbs well and not greasy. Best body lotion - hydrates but does not feel sticky. Dries within a short time and keeps the body hydrated. Also, no strong odor to compete with your fragrance. Been a huge fan of Complex 15 products for over 30 years. Love them! I use the face cream also and am a big fan of both cream and lotion. I just wrote a review of the face cream and forgot to mention the speedy arrival of my orders and the personal greeting from the person who filled the order. This product is not available close to me anymore. I found this site online and so happy to be able to get it again. My dermatologist told me about it many years ago. Complex 15 is so light and non-greasy. I prefer the lotion over the cream, but have used the cream when I could not get the lotion. The service from well.ca is excellent, also. Best simple light moisturizer. I have super sensitive acne prone combination skin and was introduced to this product 15 years ago. Life saver. Super light, not greasy. Feels like water so aside from reading the ingredients you know there's not a lot to it. Shipping to small town USA can be spendy but it's well worth not having to find a comparable product. Best 'bland' moisturizer on the market. I've tried both the cream and lotion version and find the lotion to be more hydrating, oddly enough. I've tried every other no-frills moisturizer out there and this is the one I buy again and again. No scent, not greasy, absorbs quickly, hydrates well and no breakouts. This is in no way a heavy duty moisturizer so if you're really dry look elsewhere or use underneath something richer, but for day-to-day this is simply perfect. I have been using the Complex 15 for years. My dermatologist recommended the lotion for my sensitive skin. The lotion goes on smooth and light never greasy. Complex 15 is a product for someone who has allergies too. Wonderful product I could not have received if it has not been for Well.ca. Their service is fast and customer service great. I've been using Complex 15 for over 25 years and I love it. It's light and non-greasy & is overall an excellent lotion. The pharmacies in my area no longer carry it which surprises me because it's a great product. So, I'll buy from well.ca from now on. It arrived super quick too. Absorbs really fast (which I love), but it doesn't moisturise my skin for long. My skin feels like I haven't applied any moisturiser to it all and starts to feel dry approx. 30 mins after application. It's definitely not effective in the winter months. For an unscented moisturiser it has a musty smell to it! Very dissapointed given the favourable reviews. Absolutely the best. Absorbs and coats skin without a greasy feeling. Protects and keeps skin nourished all day long. I have been using Complex 15 Body Lotion (I use it on my face only) since I was 18 years old, when my dermatologist recommended the product for my sensitive skin as well as to help prevent breakouts. That means I have been using it for 35 years! (honest to goodness I have never used anything else) Complex 15 truly provides the perfect amount of moisture to your skin without any greasey feeling at all, it works beautifully under makeup as well as an overnightcream. When I realized that I couldn't get it here in the USA anymore I was shocked and anxious at the thought of trying to find a replacement. Then I found Well.ca! The artwork on the bottle is new so I compared everything to my bottle at home - it is the exact same product. The price was not inflated and I received my shipment very fast. Thank you Well.ca for carrying this product and also for the wonderful service. I've been using this product for years and love it! Since the U.S. quit carrying it I have been ordering it from Well.ca and found they have the best service and best customer service anywhere! I also get my order faster than I do here in the U.S. I have been using Complex 15 for a number of years- such a quality product. I'm so pleased you carry it! Not sure why I cannot easily get it in the US anymore. This product is quickly absorbed, non greasy and leaves skin soft and smooth all day. Amazing. Best product out there. Thank you for carrying it. My dermatologist recommended this to me many years ago. When no longer available in the States, I finally found it with your company. I am so grateful. I have fund other products that I use & have purchased through your company. Thank you. I have use product 15 for years and a couple of years ago it was not available in the states. Thank u for having it on your web site. Will be ordering again soon. Been using Complex 15 Body Lotion every day for over a decade and love it. I've been ordering it from Well.ca since distribution to the US has been discontinued. I order 10 bottles at a time to take advantage of the free shipping using a credit card with no foreign transaction fees that accrues frequent flyer miles. Free shipping, no transaction fees, miles, great lotion. What's better than that, right? Great product at a very good price. I live in the U.S. where they no longer make Complex 15 and on Amazon/EBay they sell for outrageous prices, so glad to find Well.ca. Also, delivery was fast and the packaging was excellent with the product wrapped in plastic to prevent contamination. Thanks Well.ca employees! I have been using Complex 15 for years. It is outstanding. I was so disappointed when it was no longer sold in the US and delighted to find it on Well.ca at a great price and with fast delivery. Can't get this product in America but can always count on my Canadian neighbor to ship it to me within days. Really appreciate your great service. In my humble opinion, Complex 15 is the best body lotion you can buy! It works great while being non-greasy and fragrant free. (As opposed to some lotions that claim to be fragrant free but really aren't!) My disappointment when it was no longer available in the U.S. was finally overcome when I found it on-line at well.ca. The ordering process and delivery time to MN was also outstanding! a wonderful product! love the results on my skin and its non greasy. Have been using this uniquely ungreasy lotion for 30 years and it is no longer distributed in the US. Thanks to Well and Canada! Non greasy and absorbs fast so the drying time is minimal. However, it's still thick enough that it does the job. I have been using the product on and off (mostly on) for about 30 years. Wonderful product been using for years!! Non greasy. Can't say enough about it. The perfect face & body lotion. A shame can't find it in United States anymore! So HAPPY to be able to find it at Well.co!! I have used this lotion for years when it was available in the US and was very disappointed when it was discontinued. I was thrilled to find it available via well.ca. I can tell the difference in my skin when I use it. The lotion really does penetrate the skin to soften. I have rosacea and my dermatologist approves it without reservation. My husband uses it too for his super dry skin. I was advised by a friend of this lotion. My wife and I have used multiple kinds of lotion which never helped our dry skin.. By far this is the best lotion you could ever buy.. Absolutely no greasyness after applied and keeps you skin mosturized for the whole day.. Thanks well.ca for the great price.. I would recommend this lotion to everyone. This product was recommended to me by a doctor in the 90's and I have been using the US version ever since. I was very upset when it was discontinued and tried using many, many other brands all of which were discarded after using some once, some twice. Complex 15 absorbs into my skin whereas everything else I used sat on my skin and I could still feel it hours and hours after use. So glad to find this product again and my skin is very happy. Best lotion ever! Healing and non-greasy. We were very disappointed when we could no longer find it here in the US but we are thrilled to be able to purchase from Well.ca This performs exactly like the US formulation. I have used Complex 15 for many years, it is one of the few lotions and creams that does not make my face break out. I have recommended it to others as I am 70 and people tell me that I have a good complexion and ask me what I use. 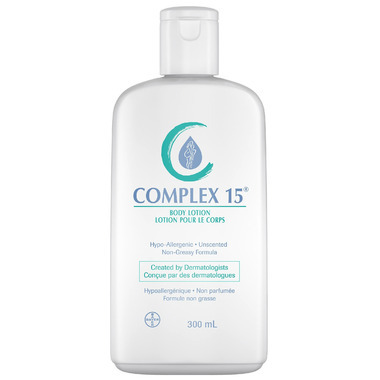 I really like Complex 15's light non-greasy feel which is particularly good in a hot humid Texas summer. Sadly I can no longer find it in the USA but thankfully I can purchase via the internet from Canada. Been using Complex 15 products for 30 years. Was very disappointed when the price went up so high. The face cream and body lotion are wonderful products. I'm 84 years old and I'm told that I look at least 10 years younger. So happy to find the cream and lotion at Well.Ca. at a reasonable price. Please don't change a thing. Thanks! Excellent product! This lotion was doctor-recommended to me many many years ago, and I rediscovered it a year ago. It is a non-greasy, clean feeling, truly unscented lotion â€” very gentle, but very moisturizing. Just last week I recommended it to a friend with severely sensitive skin. I'm sure she will love it. I am middle-aged guy and agree with the majority of reviewers. I used this as an after-shave lotion for years until it stopped being sold in the USA. I tried many products after that and none have been as good. Non-greasy, light, absorbs quickly, no perfumes, good price. I am so glad I found it here at Well.ca. I encourage Americans and Canadians to keep buying it so they don't stop selling it altogether! I ordered several bottles but my experience is that it does not keep forever so I will not order in bulk. ***** FIVE STARS!! Complex 15 was recommended to me by a dermatologist 34 years ago and I have used it ever since. Best lotion there is. He told me it was one of the only lotions that had water molecules in it's chemical formula. So glad it's available at a reasonable price. I have been using this for 20 years and have found nothing better. OMG I finally found someone who sells this again, I have used for 20 years then they stop selling it. Amazon has it for way more money that is crazy. Thank you for selling this. LOVE LOVE LOVE IT!!!!!!!!!!!!!!!!!! I cannot live without this lotion. I've been using this lotion for many years. When I discovered that you can no longer get it in the United States, I almost had a heart attack. Does anyone know why this is no longer available in the U.S.? This is insane. A product that is the gentlest, most basic lotion that actually feels wonderful and doesn't feel sticky, stinky, or greasy, and they no longer sell it across in the U.S.? Really? I've been putting on lotion, head-to-toe, everyday after showering, since I was a toddler. Needless to say I've tried a lot of lotions over the years. I think Complex 15 body lotion is by far the best for quite a few reasons. It's a true unscented lotion, mostly water and very hydrating, less viscosity (thick gooeyness) so you don't have to rub so much to work it into your skin, no oily residue so it's non-staining and it dries quickly because your skin absorbs a lot of it. It's a very stable product. I've been using it for over 10 years (probably more) and it hasn't seemed to change a bit. In fact the packaging has only been updated slightly once or twice. Sadly, distribution of Complex 15 has been discontinued in the US. I'm so happy to find it in Canada and I'll be ordering it in bulk. and am able to purchase from you. Very good buying experience, customer service and shipping. All went well and would recommend your site to others. Thanks again. This is the absolute best face lotion you can buy. I actually use it every day for shaving instead of gel or foam and it is simply amazing. I received a sample from the manufacturer after graduating from pharmacy school in 1990 and have used it regularly ever since. It softens and moisturizes the skin to a natural feel, has no odor and is not greasy. It never burns or irritates and does not plug pores. I have used Complex 15 for awhile now and I love it. I am allergic to scents and this is truly unscented where some products claim this but you can still smell something. I have trouble finding the body lotion in the bottle as I use the tube lotion for the face, too. That is easier to find in the stores but not all stores carry the bottled body lotion. The lotion is light and absorbs quickly. Thanks Wells.ca for carrying this and on sale, too. I love Complex 15! It's scentless, non greasy, doesnt clog pores, absorbs quickly and actually works! It's nice to have a moisturiser that doesn't assult your nose with a powerful scent. It's by far my husband's favorite for this reason. Excellent light and non-greasy lotion. My diabetic friend had this recommended by her specialist, and she gave me a bottle to use. I'm pleased to find it here, as I need more. The lotion is fragrance free, and quick drying, and does its work better than anything else I've tried. This is a hidden treasure of a product! This product was recommended to my by a dermatologist 20 years ago and I love it! It is very difficult to find in stores so I am so thankful that through well.ca I can still get it. The best! Scentless. No greasy residue. Been using it for over 12 years. My dermatologist recommended this lotion many years ago and I have stuck with it. It's very light and has no scent so it's great for sensitive skin. After years of trying different products, this lotion all of the time. It does a great job softening my dry skin and does not cause any irritation. It isn't greasy and is quickly absorbed by the skin. It doesn't have any odour or fragrance.